This post will show you how to make the best mouse trap with just a cardboard box and a glue trap. In 2004-2005 I lived in inner city North Philadelphia doing community service for the surrounding area. While living there, I experienced a mouse infestation like none I have ever encountered before. Making matters worse was that each house (much like the houses in San Francisco) were row homes, homes sharing walls between them interconnected like. So if one house had mice, it was likely the other homes connected on that block would eventually have mouse problems as well since their walls were all shared. The first month we lived in the house, we just purchased glue traps from the corner store and set them out near walls and corners in the kitchen. It wasnt long till we found that the only mice we caught were the really young inexperienced ones. 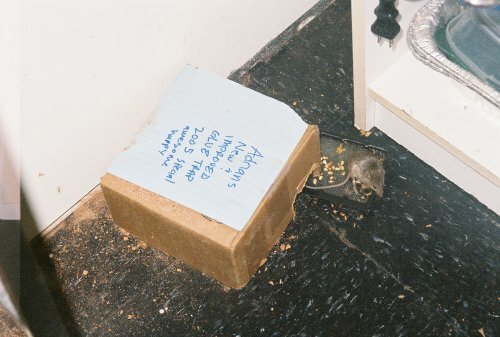 On several occasions we witnessed older mice jumping over the entire glue trap or running around it when scampering away from my screaming female roomates! One can only handle seeing mice all over the counters, furniture, and food for so long. After three months of sitting around and indirectly providing only smart mice for natural selection to the mouse population did I decide there had to be a better way. After all was said and done, we bumped up the catch rate from 6 mice in the first three months, to 58 in the remaining 6 months. The trap was so inexpensive and effective, I was going to patent it until I realized that to do so was around $7,000. Anyways, if you want to catch mice 1000x quicker and more effectively than just using regular glue traps you need to make just one simple change. Make an enclosure out of a used cardboard box and immediately make a better mouse trap! From the picture above, you can see its nothing more than a cardboard box with the bottom of the box cut off making it have a total of 5 sides instead of six. There are then two holes made (on opposing sides), that are opposite each other. The key to this box is the cardboard flap which allow the bait to be suspended above the glue trap. The dotted line is where you place the glue trap. 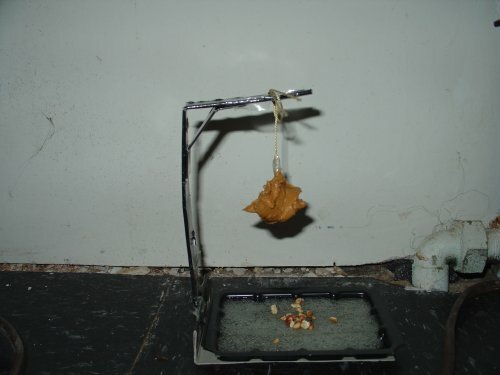 The premise is that the mouse will enter the enclosure after smelling the peanut butter which is applied on the flap suspended above the glue trap. 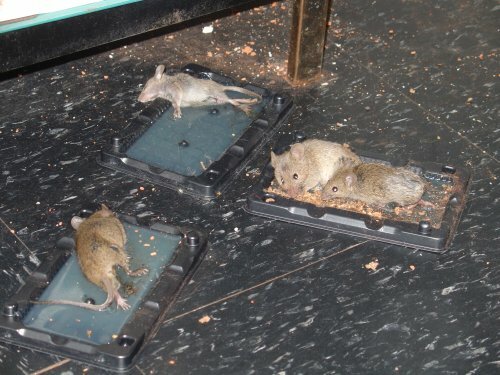 The mouse will attempt to jump or stretch to reach the bait, and inadvertently step or fall onto the glue trap. My finding is that this works extremely well, however, during the first week, there was little success. It wasn’t until the second week sometime and after reapplying peanut butter two times did the trap really start catching mice. I found that the oils from the peanut butter soaked into the top of the box drying out the peanut butter. It wasnt until the third application where the box then smelt entirely of peanut butter (increasing the draw for the mouse to enter), and where I no longer needed to reapply the peanut butter because of it drying out. In fact, I only occasionally needed to reapply the bait as the box now smelling of peanut butter was really attractive to the mice. In this particular photo, we caught all these mice in one day. I tried to replicate the concept of the enclosure without the enclosure. In the photo above, I tried to see if the bait suspended above the trap would still work without the enclosure. After a few weeks, we were only able to capture one young mouse and I chalked it up to a failure. The lesson I learned was there was something involved in the enclosure which provided a sense of security or helped relax the mouse enough for it to enter (possibly because it was dark inside the box further concealing the trap, and they could see an exit on the other side of the entrance which gave them assurance of an escape route), and I believe coupled with the super saturated smell of the peanut butter (from the oils soaking into the box), it provided enough oomph for the mouse to be baited. I mentioned previously that I wanted to patent this mouse trap, but who would buy a trap that was just a cut-up box? 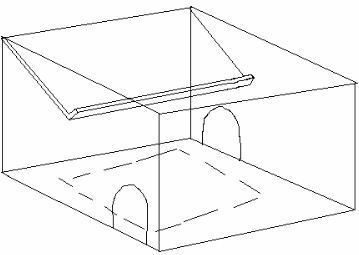 Well, I had to get a little bit more creative and came up with the idea of an enclosure with an integrated glue trap which could be folded up for sale, and “popped” back into form when ready for deployment. The top portion of the box would open and allow for the bait to be applied onto the flap. The trap would be made entirely of some recycled cardboard, and allow for easy disposal should a mouse be caught. One wouldnt have to even see the mouse or touch anything except the enclosure once the mouse was caught. My idea for a fully enclosed disposable glue trap complete with handle and sticky trap for easy deployment and disposal. If you have any questions, or even want to know more about this mouse trap, let me know. Being that i submitted a provisional patent which I let expire, I dont believe this idea can be patented any longer. Therefore, why not put it on the internet! Enjoy! P.S. If you happen to make this trap and have success, please send me pictures and write me a note! 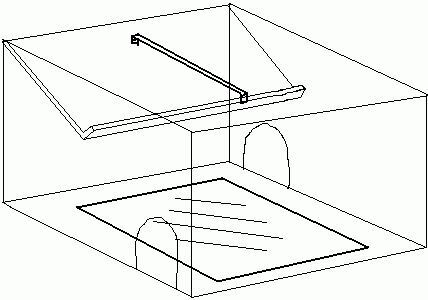 This entry was posted in Home Improvement and tagged bait, best, best mouse trap, build a mouse trap, cardboard box trap, diy mouse trap, enclosure, glue trap, mouse, mousetrap, peanut butter, trap on September 12, 2011 by Blog Master.